Sriracha Black Pepper Pretzel Nuggets - A Spicy Snack!Sriracha Black Pepper Pretzel Nuggets - A Spicy Snack! 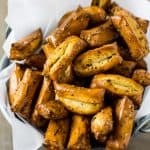 My Sriracha Black Pepper Pretzel Nuggets are a crunchy snack, both spicy and salty, that will wow you with a hint of smoke! In a small bowl mix the Worcestershire sauce, Sriracha, and black pepper with the olive oil. In a medium bowl pour the pretzel nuggets. Pour the Sriracha Olive oil mixture over the pretzel nuggets. Pour the coated pretzel nuggets onto the lined baking sheet. Be sure to get all the coating mixture out of the bowl with a spatula. You don’t want to leave any behind! Spread pretzel nuggets into a single layer. Bake at 200F for 50 minutes, stirring and respreading every 15 minutes or twice during the cooking time to prevent burning. When finished cooking, remove the pretzels from the oven. Let cool and serve immediately or store in an airtight container for up to a week! *If you are going to toss with your hands I would recommend wearing gloves as Sriracha on your hands and eventually in your mouth, eye, or somewhere else is going to hurt later!